Includes Top Handle Jig Saw - 1587AVSK-46, Footplate Adjustment Hex Key - 1 907 950 006, Steel Footplate Insert Kit - 2 601 098 01, Anti-Splintering Insert - JA1002, No-Mar Plastic Footplate Insert Kit - 2 601 099 029, Carrying Case - 1 619 800 742. Best Jig Saw on the Market! I kid you not, this thing is AWESOME!!! I bought it to cut some curves in 7/8" Black Walnut and it cuts it like warm butter with a hot knife! I mean to tell you, this saw is great! I've used a lot of jig saws and this one, by far, is the best one ever. It was reconditioned but I couldn't tell the difference from new. The 1587AVSK-46 is a well built tool. I bought it to replace my 30 yeras old and mechanically much sturdier Craftsman saber saw which stopped working when its switch gave up and could not be replaced because the required switch is no longer available. I have used the Bosch just briefly, and while it cuts fine with a correctly selected blade,I had a hard time getting the OEM Bosch blades seated and properly fixed in the blade holder (plunger). The Bosch screw-less blade fixation design, which is also used by other tool makers, leaves a lot to be desired. It is much less positive and rigid than an old fashioned set-screw blade holder design. Anyone who uses tools for a living knows that there are tools recognized as undeniably the best, and this is one of them. As far as Jig saws go this one stands alone. The other model with automatic blade lock is lacking in how tightly the blade is fixed , and therefore cannot be recommended. Smooth is the word, both the way it runs and the cuts it makes. In a past life I cut letters out of plywood for signage, as demanding as it get for jigsaw work,and this one never let me down. Slap in a fine finish blade and you barely need to sand... Now days I cut out sink openings, radius deck corners, do cut outs in decking and subfloors. 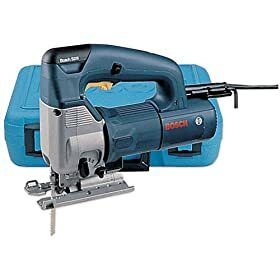 Everytime I use my Bosch, I marvel at how well it is made,how wonderfully it runs, and what a good investment it was. I have had a number of jig saws in the past. This one seems to work the best of any I have used. The variable speed is precise. The jig saw fit my hand right and was easy to push the lock on button. After a little practice, changing the blade was easy. I used ONE of the new progressive blades to cut curved ends on (28) 2x6's and (12) 2x8's for a pergola. The cuts were straight and smooth on the treated lumber. Nice saw with a good feel and plenty of power. The blade stays straight and cuts are smooth. The trigger is very precise allowing virtually any speed range between off and full on. The black pull up blade changing handle pops off almost every time I change a blade and being made of a rigid PA6 GF resin I'm waiting for it to break. I hope it does not since such a simple piece of plastic would render the saw worthless in an instant. Take care and some extra seconds when changing blades. GREAT Saw, can be used in lieu of a circular saw and can cut through anything ! But the blades take practice changing ! 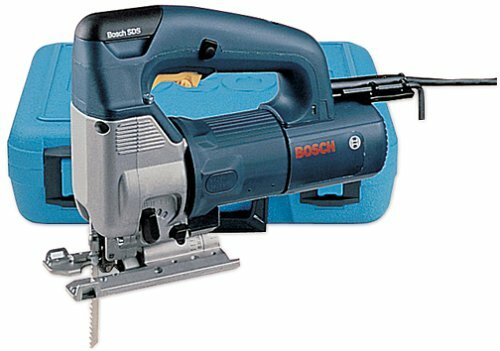 The secret is the blades and Bosch now makes the blades available for different manufacturer jig and saber saws. Let me say there has never been any piece of wood or board this thing hasn't been able to rip through, I've even cut down mid size tree and the stump with the rough wood blade. The variable speed trigger is smooth so you can use this saw for fine craft work too. Just like every other reviewer, I have to reiterate the blades are tedious to change, it is a tool less system that has to be finessed. TIP: When it arrives and you've made a few cuts, practice removing and replacing the blades until you have the routine down. This is important because the blade will warble if it isn't tight, this happened to us but no one was injured. If you already have a nice jigsaw and want the same cutting power, see if Bosch is offering their blades for your model, the bi-opposition teeth design is the real secret. This is my first Jig Saw and I am 110% pleased. It cuts through wood like butter & so easy to handle. As this was my first time using a jig saw I was very intimidated by it and thought maybe I spent a little too much on it - boy was I wrong! I bought a less expensive one (Sears brand) and there was no comparison. It is worth every penny I paid for it. I can't wait to use it again (and again....)! This is easily the best jig saw I've used in my years of woodworking. Amazingly smooth, powerful and easy to control. I balked at the price of a new one, but when I found one reconditioned, I jumped at it and I am very glad I did. In hindsight, it's well worth even the full price.